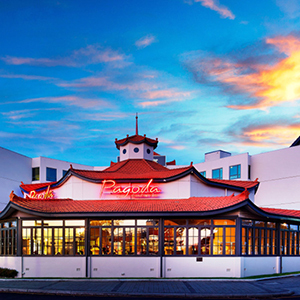 Nestled on the shores of Perth’s famous Swan River the Pagoda Resort & Spa is a local icon originally established in 1926. The resort offers a variety of venue options to ensure the perfect location to match your dream vision, accompanied by a poolside ceremony location, resort facilities and a choice of accommodation rooms, including a Bridal Suite the Pagoda Resort & Spa offers all of the facilities to cater for your special day. As every wedding is unique, the Pagoda prides itself on offering flexibility without compromising on the highest level of service and offerings. The resorts dedicated Wedding Coordinator will be there through your journey to ensure that every detail is taken care of, so you are able to savour every moment of your special day. We invite you to meet with us to view our wedding venues and discuss the details of your dream day. Our friends at Dazzling Letters offer one of Perth’s most extensive ranges of light up letters, light up numbers, large letters, lighting, dance floor, furniture, décor & games to suite any special occasion from weddings, engagements, birthdays, corporate events. A family owned and operated business, Dazzling Letters are committed to personal and professional customer service. Give them enough notice and they can create custom letters or numbers to suite your needs! For more information on how to ‘Dazzle’ you next event, simply contact Dazzling Letters directly through their website or drop us a line if you would like to bundle some light up letters in with your Perth photo booth hire to make things easier. If you are searching for a fresh and energetic vibe for your special day, then Kirk could be just the wedding celebrant that you are looking for. Kirk’s approach is simple: To provide couples with a wedding ceremony that is filled with love, passion and zest. A member of the Australian Federation of Civil Celebrants, Kirk’s attention to detail throughout the planning, lead up and ceremony itself is second to none. If you are on the lookout for a young, fresh and energetic wedding celebrant to help make your day just what you want, then check out Kirk’s website.